Please join us in celebrating Lisa Ellis, Director of Nursing at Community Health Connections in Fitchburg, MA. 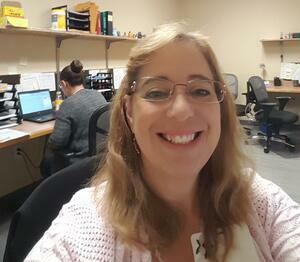 Lisa is Equiscript's Site Champion Spotlight for October! Site Champions play a very important role in the success of Equiscript home delivery pharmacy programs across the country. Site Champions are chosen by the leadership at their health centers as a point of contact between the Equiscript team, providers, and patients. They are super-organized, super-involved superstars who carry out the tasks necessary to make a successful program. Lisa Ellis is the Director of Nursing at Community Health Connections in Fitchburg, MA. Community Health Connections is a federally qualified health center that first opened in 2002 and now has four locations. Lisa has been serving patients at Community Health Connections for the past seven years. As someone who is dedicated to providing high-quality care to her patients, one thing that Lisa likes about the Equiscript program is, "Knowing that patient safety is being maintained for our vulnerable patients for whom home delivery is essential." Client Relationship Manager, Zach Wielgoszinski, said, "When I first met Lisa, I could tell she has a great passion for the work she does. She works tirelessly at what she does and takes great pride in her work. Her tireless efforts are proving to make great strides in the community." Our top Site Champs understand that communication is key. "Working regularly with our Account Manager (Ali Fortin) and Client Relationship Manager (Zach Wielgoszinski) has been crucial to obtaining and maintaining prompt home delivery pharmacy services for our patients," said Lisa. The efforts of Site Champions help to ensure that patients get the best quality service, and that they get their medications when they need them - which keeps patients happier, healthier, and more compliant with their healthcare. Thank you, Lisa, for being a top-notch Site Champion!